In this magical debut, a couple's lives are changed forever by the arrival of a little girl, wild and secretive, on their snowy doorstep Alaska, 1920: a brutal place to homestead, and especially tough for recent arrivals Jack and Mabel. Childless, they are drifting apart--he breaking under the weight of the work of the farm; she crumbling from loneliness and despair. In a moment of levity during the season's first snowfall, they build a child out of snow. The next morning the snow child is gone--but they glimpse a young, blonde-haired girl running through the trees. This little girl, who calls herself Faina, seems to be a child of the woods. She hunts with a red fox at her side, skims lightly across the snow, and somehow survives alone in the Alaskan wilderness. As Jack and Mabel struggle to understand this child who could have stepped from the pages of a fairy tale, they come to love her as their own daughter. But in this beautiful, violent place things are rarely as they appear, and what they eventually learn about Faina will transform all of them. THE SNOW CHILD is at once an ethereal and magical tale of longing and love, and a brutal story about grief and survival. Ivey is smart enough to keep Faina enigmatic.... Ivey's captivating style is somehow both lush and concise. She has managed to craft a novel true to its fairy tale source, but shot through with a contemporary sense of bleak reality only occasionally getting bogged down in sentimentality. Though the narrative is not always as tight as it could be and some readers may want more definitive answers, THE SNOW CHILD is well worth a read, especially in these last chilly days of winter. Ivey's writing captures an Alaska that is at least as strong as any of the characters challenging the wilderness. She writes lyrically and lovingly of hardship, friendships and the bond between neighbors. Mabel and Jack's love for their new home grows gradually, but as surely as the reader's love will grow for the characters and the story they live. Ivey's intimate knowledge of the Alaskan wilderness -- she was raised there and lives there with her family -- infuses her novel with an intangible beauty. Despite the thick desperation of her characters, Ivey focuses on the bright, yet fleeting light that enters their lives, and as one character urges, chooses "joy over sorrow." 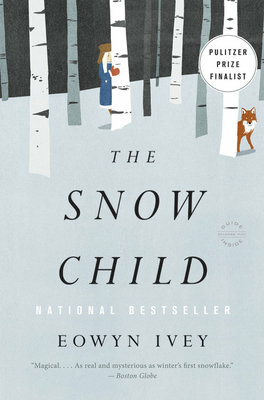 In "The Snow Child," first-time novelist Eowyn Ivey plays with the Russian tale "The Snow Maiden," turning it into a stunning and startling adult novel, full of wonder, longing, hope, pain and beauty.... Readers will be drawn in by the mystery and Ivey's elegant language. The cold and remoteness are deliciously rendered, the imagery fantastic. The real magic of this story is that it's never as simple as it seems, never moves exactly in the direction you think it must.... As much as I loved falling under the spell of The Snow Child, in colder moments I became aware that it's too long. The plot isn't really complex enough and Ivey's style isn't rich enough to support 400 pages.... That said, when I was wiping my eyes at the end  must have been snow blowing in my face  I felt sorry to see these kind people go.